2017 Independence Day Symphony of the Lakes concert in Winona Lake, Ind. 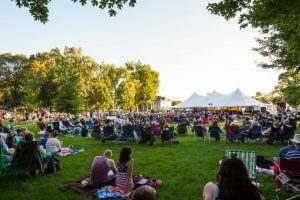 The Symphony of the Lakes returns with the second summer concert of the Grace College and Village of Winona Lake Festival of Music. “Rockin’ with the Symphony” will take place on Saturday, June 30, at 8 p.m. in the park at Winona Lake, Ind., below the outdoor amphitheater. The free outdoor concert will feature hits from the 1950’s to today as well as patriotic classics. The annual Independence Day fireworks will follow the performance. In case of rain, the concert will take place in the Gordon Recreation Center, 100 Publishers Dr., Winona Lake, Ind. Audience members are encouraged to bring a chair or blanket and arrive well before the 8 p.m. start time to get a seat. The third annual Festival of Music is sponsored by Grace College and The Village at Winona. “Rockin’ with the Symphony” is sponsored by Wagon Wheel Center for the Arts and is underwritten by a grant from the Kosciusko County Community Foundation’s Kralis Community Funds and Mikesell Endowment Fund for MasterWorks. Support is also provided by Parkview Health, Pinnacle Advisory Partners, and Walmart. Upcoming Festival of Music concerts include the Jazz Festival on July 28, the Southern Gospel concert with the Booth Brothers on Aug. 5, and the Contemporary Christian concert featuring Sarah Groves, Andrew Peterson and Over the Rhine on August 11. Visit grace.edu/musicfestival/ for more details.